1. Morning hugs from my children. 2. A long skype call with a friend too far away to visit in person. 3. Quiet mornings with a warm drink. 4. Soft new snow blanketing the old and making the landscape brilliant again. 5. Love notes on the kitchen whiteboard. 6. Warmth inside, even when the temperature outside is in the single digits. 7. An unexpected letter arriving in the mail. 8. A fictional character voicing a prayer that speaks directly to my need. 9. Opening the weekly sales ads and realizing that roasts are on sale the week that I’m craving roast stew. 10. A wise old ladybug somehow surviving snow and cold, finding her way inside our warm home, and lighting up the world of a six-year old girl. I’m thankful for the warm drinks and the convos as well. Miss you! LOVE the message on that white board! 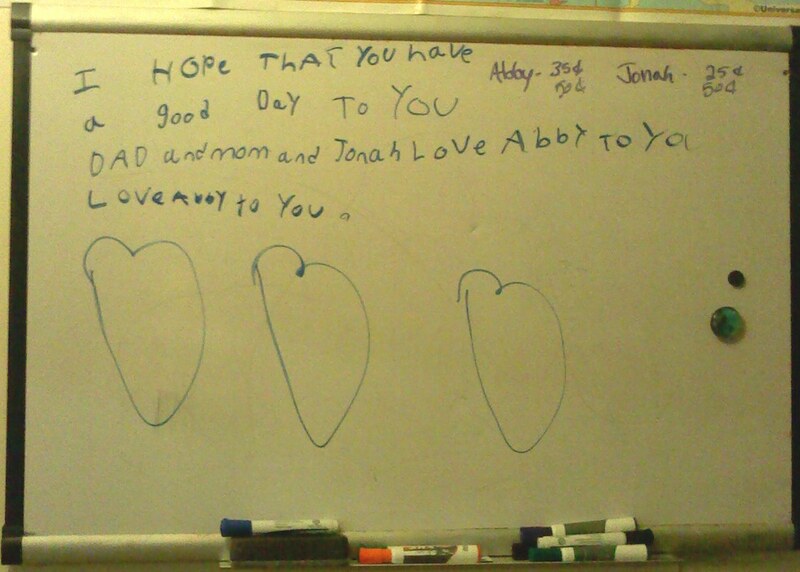 Abby & Jonah, you make my heart smile!